I'm not quite done with the terrain pieces I wanted to review this week (I bit off a lot more than I can chew on that one), so I started with my normal fall-back of suggested purchases on DriveThruRPG. 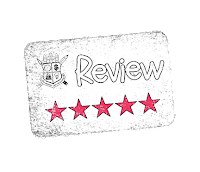 This week's review item caught my eye because, well because it seemed oxymoronic to me since it was a "freebie" map that costs $1. The map was from Paratime Design, so I felt comfortable giving it a little leeway up-front, which lead me to this twofer. Evidently there are some Friday Freebie maps you can download off of Paratime Design's website. These maps aren't wimpy maps either. The freebie map version of this $1 map comes in roughly at 17" x 23" with a screen resolution of 72 dpi. There are two versions, light background and a dark background. Really not shabby at all, definitely worth the price of free. Of course this begs the question, "Why would I want to pay $1 for a 'free' map?" First off, the map is a higher resolution, being offered on a US Letter page (21.6 by 27.9 cm) and 300 dpi. No security, but also no PDF property tagging either (which I really don't care about when it comes to maps, just noting because this is something I look for). The great thing about this map, the thing that distinguishes this product from the freebie maps, is that the PDF format (I know that "PDF Format" is redundant) is taken advantage of by allowing a large number of display options. There are 9 listed viewing options, but only 8 actually "do" anything. In addition to selecting the light or dark background you can choose to display (or not) room numbers or secret doors. While you could easily get by with the freebie map, tweaking the higher-resolution map will get you a lot more mileage. Odds are you'll have to select the viewing options you want and then print the map off to another PDF which you could then open in your chosen digital editing software. Since the PDF isn't secured, this is a viable option. If the PDF was locked-down, this map would probably not even rate 3 stars because you'd be locked into using the PDF on-screen only, unless you printed a physical copy. This would realistically write-off the file for use with a VTT as you'd probably be better off with just the freebie version. 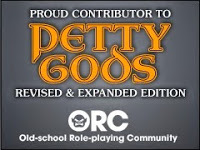 I know I harp on PDF security a lot with my reviews, but this product from Paratime Design is a great example of doing things right, and I know from experience that as a publisher on DriveThruRPG you have to go just a little bit out of your way to make sure that PDF products do not get auto-locked-down by OneBookShelf. It is great to see publishers using PDFs to their best effect, and this $1 "Friday Freebie" map is an excellent example. 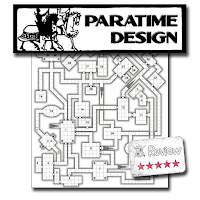 If you need a dungeon, especially if you need a VTT dungeon, then these maps from Paratime Design should be right up your alley.